I am excited to say I am heading home in December to walk the land this mid-Winter. I shall give offerings of only the best whisky to the great crone, listen to what stories the bones of the Great Antlered One might tell. Home for me is in the lands of Clutha, under the wing of Talieasker, the calls of Cee-al, the fires of Brighid and a place where the great bear now only walks in spirit. 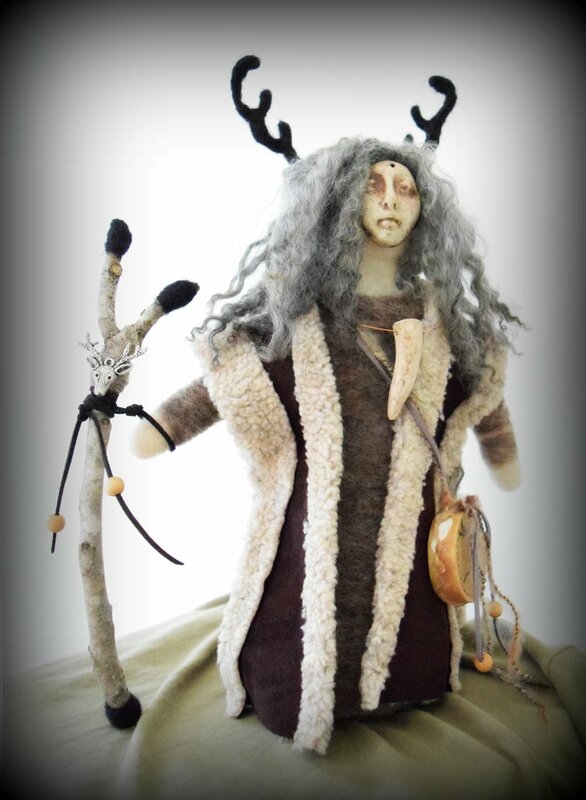 If you’d like your own antlered women doll I’m currently taking orders through until the 16th November. The current making time is 3-4 weeks with all orders being shipped by the Friday 14th December. Stories of an antlered mother come from the northern hemisphere. As some of these cultures moved south and away from living with reindeer that mother figure changed shape to deep and cow - who were often dressed with antlers - as it is only the female reindeer who wears antlers. Other cultures hold the doe as a mother figure. This doll is the keeper of the mysteries of all that which we have lost and yet some of that ancient wisdom remains in threads of songs which swim in our blood and ancestral knowledge which is knitted into our bones. That ancestral knowledge can be sparked and ignited which we can see in many women who connect to the figure of antlered females and Goddesses. These images speak directly to an ancestral longing. This doll honors that connection and recognizes that the longing we hold - acknowledges what is missing in us which we see in her. She mirrors the values we may wish t reclaim, the mysteries, the ancestral wisdom and what we have lost touch with. This doll is a symbol of an ancient lineage of women who honor the old antlered one. A lineage which stretches back to women who followed great herds of reindeer. These are the women who wore antlered headdresses, and to the beat of their drums moved between the worlds and ran with the herds. Her drum wears the symbol of her lineage of women who wear antlers. She comes from a time of ice, a time when great herds of reindeer crossed from mainland Europe across the land to Britain. She comes from a long line of priestesses who followed the herds and her descendants can still follow the ancestral tracks between the worlds hundreds of years since the reindeer died out. She Who Runs With the Herds holds that ancestral knowledge, the guardian to the mysteries of the antlered kin - she is the female leading the herd, the priestess leading her people. 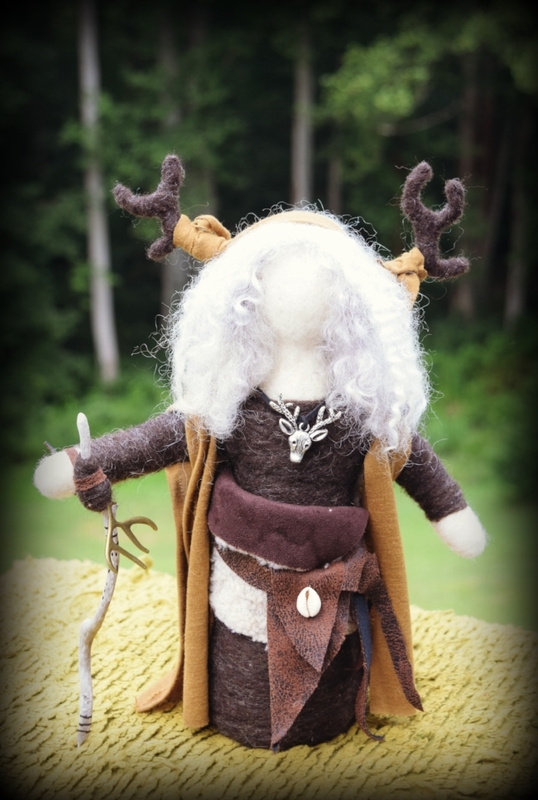 These dolls are inspired by a long line of priestesses who protect the deer herds. They are the ones who sing charms so the deer become invisible to hunters. It is said that the original priestesses were shapeshifters and in an action of dressing as a deer in deer skins could magically change shape and bound away over the bracken filled hills to hide in the great oak forests.